Iran is situated in the Middle East; it is a culturally and historically rich country with both mountainous and desert regions. 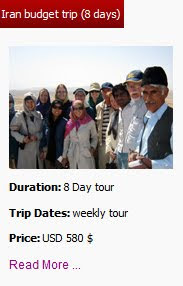 There are also many things to see and planning is paramount to ensure you get the best out of your trip. The capital Tehran is often described as an over crowded concrete jungle, but this description is not the whole picture, the inhabitants are very welcoming and given the chance will embrace visitors to their city with great hospitality. There are many cultural and historical places to visit here such as the National Museum and the Treasury of national jewels, the latter displays a not to be missed array of fine jewellery said to be the most expensive in the world which demonstrates the wealth of past rulers and dynasties. Another museum is the carpet museum which has on display a 450 year old carpet. Tehran is also home to one of the biggest bazaars in the world so a great place to do any shopping that you may have planned. Carpets in Iran are some of the most sought after in the world and carpet shops are often a buzzing place where tea is offered and cash may be exchanged. A four-hour drive from Tehran, the Caspian is Iran`s Riviera, with a narrow plain of paddy fields and orchards separating the sea from forested mountains. 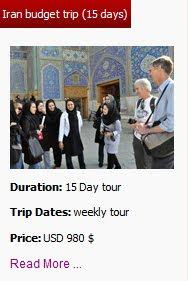 Other cities of interest include Kashan, Abyaneh and Esfahan. The latter is most famous for its amazing mosques and beautiful palaces. It has a picturesque river walk as well as the famous Qesariyeh bazaar. 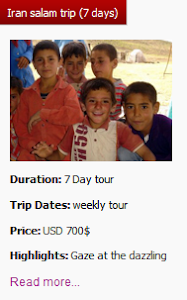 On a practical note it is worth knowing that you should take enough cash for your whole trip. MasterCard is accepted in some places, but credit cards should not be relied on as the sole means of payment and will not work at cash machines either as they only give money to locally issued cards. Dollars used to be recommended for western travellers to bring but Euros are now preferred. They can be changed locally in the Iranian Rial. Iranians are very hospitable people and may invite foreigners into their home for tea, this is an honour for them, but it is advisable and respectful especially for women to dress appropriately, a loose scarf worn over the head and clothes that are not revealing will show a great deal of respect to your Muslim host. 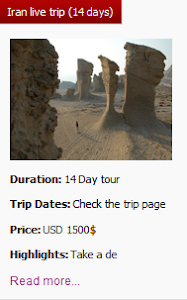 Travel in Iran is very reasonably priced, with local buses and trains being the best value for money. Domestic flight prices have risen a lot recently along with the growing inflation in Iran. If you prefer to travel by car, then consider Uppersia's Iran car rental service, it may prove to be a better option, allowing you to take in the sights and the contrasting geographical scenery that the Zagros Mountains in central Iran and the deserts around Kerman have to offer. Whatever your choice you will leave Iran with a feast of photographs and memories to cherish for a long time.